The chocolate orange flavour works really well and the icing tastes just as good as it looks. The only downside is that this raw chocolate orange brownie is a bit sticky and best eaten with cutlery. 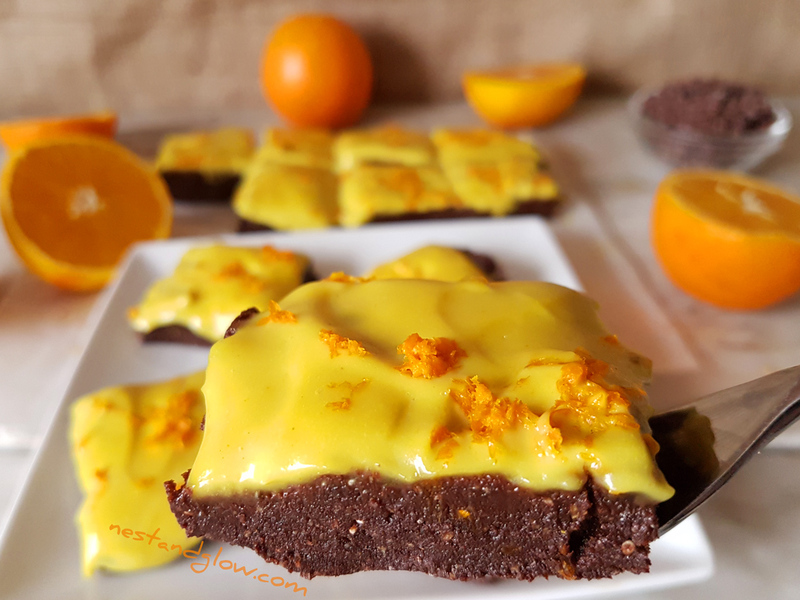 If you don’t like chocolate orange then just leave out the orange to make a raw chocolate brownie with vanilla cashew icing. Use any healthy sweetener you like for the frosting. I added a tiny amount of maple syrup as the cashews, orange juice and the dates mean the frosting doesn’t need much sweetness. You can make your own date syrup for a healthy and inexpensive liquid sweetener. To make this brownie raw make sure that the cacao you use is not toasted/cooked. No worries if all you have is cocoa as it will still taste great but will be slightly less nutritious. Some people avoid oil and this recipe tastes just as good without the coconut oil, the icing will just be a bit runnier. Or for oil free here’s a recipe for coconut butter made from just pure coconut that retains all the fibre. The only downside to this healthy chocolate brownie is that it isn’t very transportable as it’s so gooey. You could wrap it in grease proof paper to take it in a lunchbox, but it will end up a bit deformed. However the raw chocolate brownie will still taste just as good. If your blender struggles to make the cashew orange frosting smooth then add a tiny bit more orange juice drop by drop. You want to add the smallest amount possible in order to get a smooth silky icing. It’s best to make the icing in a small jug type blender. 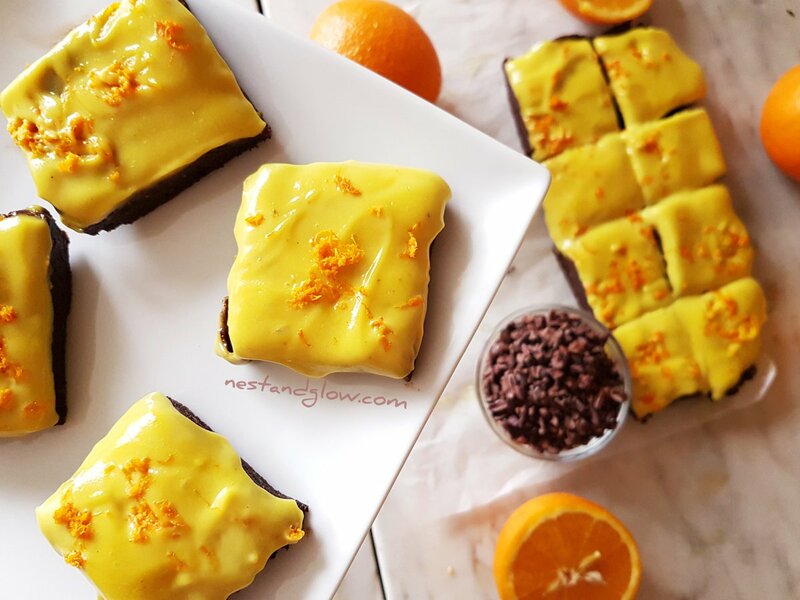 You really don’t taste the turmeric but it does help to give a golden orange colour to the frosting and add nutrition to this already healthy brownie. While I was making the frosting I thought it was too yellow and wouldn’t look good. However once it was iced it looked just perfect with a yellow-orange colour that complemented the orange zest. As with all my recipes I recommend to use a raw cold pressed coconut oil. Sadly not all coconut oils are the same – some have been heated at very high temperatures and chemically bleached. These are not healthy fats and may be high in trans-fats. Make sure your coconut oil says it is cold pressed and has a coconut smell to it. To make this nut-free replace the walnuts with half oats/half sunflower seeds and cashew nuts with sunflower seeds. This will give the healthy chocolate brownie a more earthy flavour. As sunflower seeds are less sweet than cashews you might want to add a bit more sweetener in the topping. 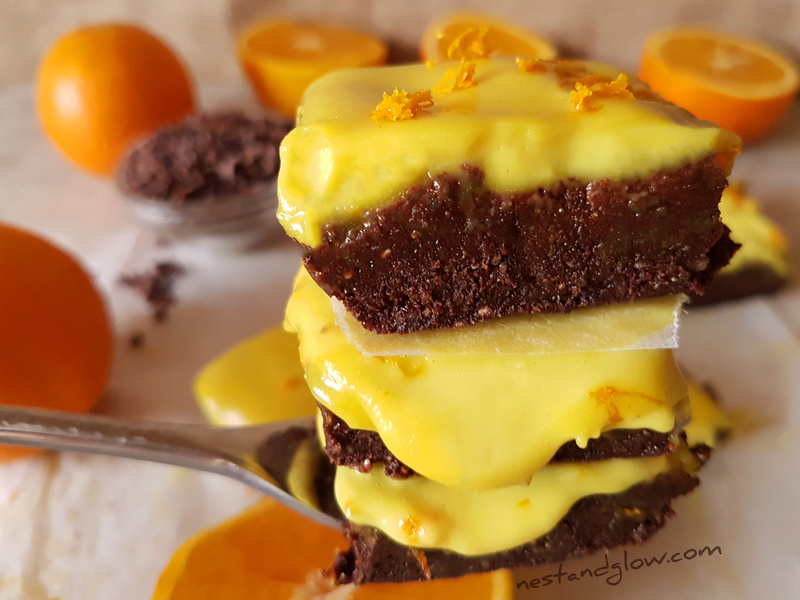 I’ve been making a three ingredient raw chocolate brownie for years with just nuts, dates and cacao but decided to mix in orange and some frosting to make this recipe stand out. This is the first time I’ve made an iced raw chocolate brownie and it turned out far better than I expected so was good enough to release without developing much. As this raw brownie recipe uses orange zest it’s best to use organic unwaxed as there shouldn’t be any additives in the skin. Taste the mixture before putting the base in the pan and add more orange zest for a deeper orange flavour. In the video you can see that I lined my dish with greaseproof paper and this isn’t totally necessary but is recommended to make life easier. I did intend this brownie recipe to be a fudge, but it just turned out too sticky in the end. Place everything for the brownie into a food processor and blend for 30-second intervals until it all sticks together and is broken up. Put all of the frosting ingredients into a small jug blender and blend for 1-2 mins until smooth. Add more orange juice if it isn’t liquid enough to blend. Push the brownie into a pan about 8″ squared using your fingers. Spread on the frosting then chill in the fridge for an hour to set. 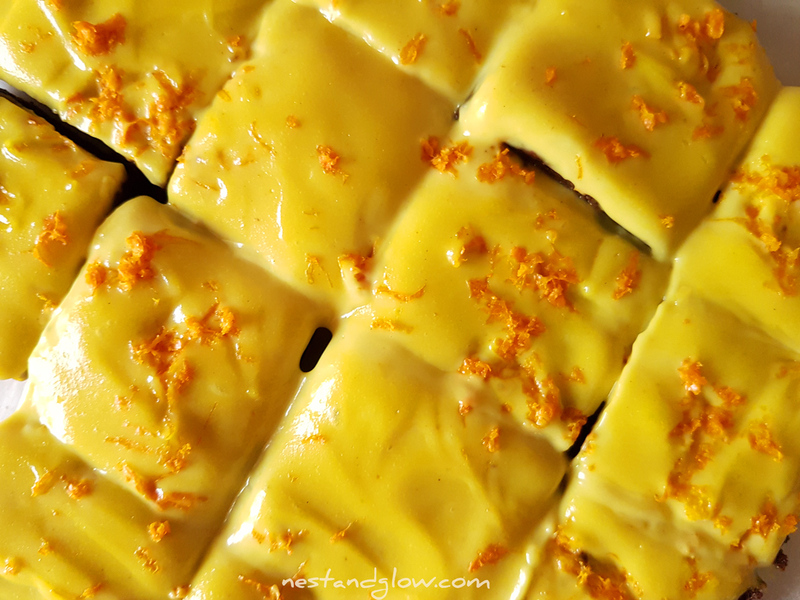 Grate on the zest from one orange and enjoy within 3-5 days.